Jordan Howden in action against Oldham. Doncaster RLFC have set their sights on climbing back into a play-off spot over the next ten days. The Dons travel to face Coventry Bears on Sunday and entertain another struggling side London Skolars the following weekend. Both are viewed as winnable games and with several of the teams above them meeting each other during the same period the Dons are determined to capitalise. Defeat for fourth-placed Whitehaven away to leaders Bradford Bulls on Saturday would see the sixth-placed Dons climb above the Cumbrians were they to complete the double over the Bears at the Butts Park Arena. 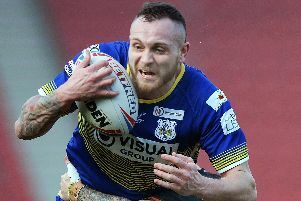 The Dons, who beat the Bears 70-10 on the opening day of the league season at a bitterly-cold Keepmoat Stadium back in February, will have full-back Jack Sanderson, wing Richard Owen and prop Russ Spiers available this weekend. Sanderson was rested against Oldham on Sunday, Owen was not considered as he had missed several training sessions due to work commitments and Spiers was serving a one-match ban. Head coach Richard Horne came in for some criticism, as results went against the Dons, for rotating the team earlier in the season. But assistant coach Pete Green says the club are now feeling the benefits of the policy as they approach the last league seven games. “It might have been frustrating for the fans that we rotated players earlier in the season but there was a reason that we did that,” he said. “You want your players to be in a good physical shape as you head into the play-offs and that is the case.